This month our Italian Food, Wine & Travel group is highlighting sparkling wines of Italy. The most widely known sparkling wine of Italy is prosecco, but there are many others that are worth recognizing, especially those of Franciacorta in Lombardy and those of Trento in the region of Trentino. Then you have those sparkling wines that are on the sweeter side like moscato d'asti and brachetto d'acqui. I've written about many of these in the past, but with prosecco being so widely produced and there being many inexpensive styles on the market it's important folks are aware of some of the best prosecco to seek out if you're desiring some Italian bubbly on your next visit to the wine store. There is prosecco and then there is Conegliano Valdobbiadene also known as just Valdobbiadene. The area of prosecco production is located in northeastern Italy within the Veneto region, but some of the top quality prosecco come from the hillside areas of Conegliano Valdobbiadene. To be labeled as a Conegliano Valdobbiadene Prosecco Superiore D.O.C.G the grapes must exclusively be grown here from the 15 communes. Prosecco is produced from the glera grape.The area became classified as a D.O.C.G in 2009, but was initially recognized in 1969. This area is also known for the first winemaking school of Italy that started in 1876 in the town of Conegliano. There are also frizzante and still versions, but they can't bear the superiore label. To take it even further there is also the Rive DOCG, which consist of only 43 sites and has stricter regulations and very steep hills of high quality grapes that are picked by hand, and Superiore di Cartizze DOCG, the top cru site of the area. I was able to sample a number of bottles from this area and shared some brief notes below. I'm not a huge sparkling wine lover, but I can appreciate quality when I taste it. Carpene Malvotti 1868 Extra Dry Conegliano Valdobbiadene Prosecco Superiore – This was was straw yellow in color with fine, lively bubbles. It showed soft fruits including pears and apples with a dry, good finish. SRP $18.99. 2015 Adriano Adami Vigneto Giardino Valdobbiadene Prosecco Superiore - This is a single vineyard cru from Colbertaldo di Vino. It's pale yellow in color with a fruity nose of apples and peaches. It had a rich mouthfeel with creaminess. Fresh and elegant. SRP $19. 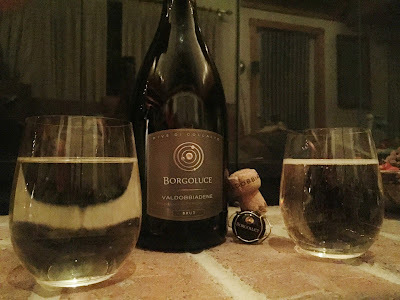 If you have doubted the quality of prosecco based on the ones you have tried that flood the markets, but haven't tried prosecco from this area I strongly recommend you try some and let me know what you think. 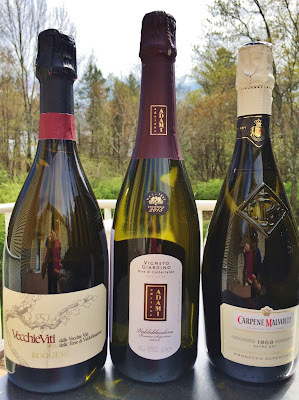 Here are the rest of my fellow bloggers look into sparkling Italian wines. Check them out! Italian Producers Beef Up Sparkling Offering is the offering from Susannah Gold of avvinare. Please join us for the twitter chat (#ItalianFWT) about Italian sparkling wine on Saturday May 6 from 11-12pm EST and check out our blogs! These bottles were received as samples, but opinions are my own. Information sourced from Conegliano Valdobbiadene DOCG. *all wines were received as samples, but opinions are my own. Pictures were sourced from Balzac Communications and Locations Wine.